Known as the Venice of the East, for centuries Bangkok has relied on its intertwining waterways and canals dispersing like capillaries into the city’s flesh. Supplement your trip with a romantic sunset dinner cruise, a breezy tour of the sights or simply an alternative to the smog-clogged congestion of the Bangkok streets. The Chao Phraya offers a leisurely portal to the past, absent of the neon and cacophony of the city. As many other ancient civilisations, the original settlers established what is today known as Bangkok along a fertile water source. Over time, the civilisation erected some of the greatest structures in its history along its banks, and the canals remain today the flourishing lifeblood of the traditional Thai lifestyle. Several chartered cruises operate to offer the highlights of the waterways, with the added incentive of experiencing the sights from a local’s point of view. Many pre-booked tours are also inclusive of entry fees to attractions, offering cheaper passes under group rates. The groups also try and schedule tours based on the least crowded times for sights. Alternatively, you can hop aboard the public river boats and ferries and create your own route. The Chao Phraya Express Boat Company operates five lines between 0:600 and 19:30 daily. “No flag” is the local line, and stops at every pier. “Blue flag line” is the tourist boat, which stops when you want. “Orange flag line” stops at the main piers. “Yellow flag line” is a large express boat for commuters. “Green flag line” is an express boat for commuters. The orange is the only local line that runs all day and on weekends, while the others only operate around rush hours for commuters. A riverside journey typically begins with the incredible Grand Palace. Built in 1782, the palace was the official residence of the Thai King and Royal court for more than 150 years. The complex itself is impressively large, situated on Ratanakosin Island and arranged similarly to the ancient Siam capital of Ayutthaya. The design is an interesting mixture of antique Thai design and Western-influenced architecture borrowed from Bangkok’s colonial era, like the impressive Dusit Hall. Today the palace is primarily used for important ceremonial occasions. Visitors also flock to the Temple of the Emerald Buddha. Officially known as Wat Phra Sri Rattana Satsadaram, it’s famous as the most important Buddhist temple in Thailand. Carved from a single block of jade, the structure dates back to the 15th century. Know before you go: Dress respectfully. Directly nearby lies the magnificent Wat Pho, with its spires soaring skyward creating an iconic skyline. One of the oldest and largest temple complexes in the city, Wat Pho houses the Temple of the Reclining Buddha, a 46-meter long statue covered in gold leaf and Buddhist “laksanas”, or characteristics. The complex also houses a school of medicine, known as the birthplace of traditional Thai massage and the earliest centre for public education in the country. At the entrance, you can purchase a bowl of coins to drop in 108 bronze bowls lining the length of the temple. 108 is a sacred and lucky number in Buddhism, indicating the 108 actions that led the Buddha to enlightenment. Across the river towers the iconic Wat Arun. Known locally as Wat Chaeng or The Temple of the Dawn, it is perhaps the most recognisable of the Bangkok temples. Rising 70 meters over the river, the Khmer-style pagoda is delicately decorated with coloured glass and Chinese porcelain. Legend has it that the temple was imagined by King Taksin following his battle out of Ayutthaya when it was taken by the Burmese army. He arrived at the location just as dawn was breaking, lending the temple its majestic name. Location: From Sapphan Taksin boat pier take a riverboat that stops at pier 8. Board a shuttle boat to the temple. Just across the Phrapinklao Bridge, you’ll find the Royal Barge Museum. While not glamorous in name, inside visitors uncover eight of the country’s most prized vessels, aptly called the Royal Barges. Each barge is carved from teak and engraved with mythical creatures gilded in gold. The boats have only been waterborne 16 times in the past 65 years and rowed exclusively by 50 specially-trained oarsmen. The museum also houses remains of previous vessels that have been damaged or destroyed during Thailand’s violent history. Know before you go: The museum may be empty during November/December to prepare for the Royal Barge Ceremony in December. Up the creep factor with a visit to the Bangkok Forensic Museum. Located inside of Siriraj Hospital exhibits include a pathology room displaying preserved babies affected by genetic disorders and a room dedicated to parasites. There’s also a forensic room that shows the bodies of accident victims and even famously displays the body of a serial killer who ate children’s livers in the 1950s. Location: Accessed off the Pranok Pier. Know before you go: Entry for kids is free… though not necessarily recommended. A trip south through the Thonburi Khlongs will bring you to the Bangkok Snake Farm. Overcome your aversion to these important creatures to Thailand, and take part in the daily snake-handling and venom extraction demonstrations. The snake-handlers passionately explain the brilliance of the reptiles, encouraging visitors to appreciate their beauty. The farm’s program demonstrates responsibility and does not exploit the animals as do other local shows. Know before you go: The snake handling demonstration begins at 14:30 Monday through Friday and 11:00 on weekends. Shake off your snake encounters and head North up the Klong Chlak to the Taling Chan Floating Market. Less popular than nearby Wat Sai, the market has retained its authenticity as a Thai port of commerce. Offering up incredible (and cheap) seafood lunches and exploration tours of the nearby canals or “klongs” for just a few dollars. If you’re lucky, you’ll spot a giant monitor lizard or two. Know before you go: Get yourself a midday foot massage for only 200 THB beneath the riverbank trees. To escape the temple circuit, visit Asiatique night bazaar. The massive marketplace features small boutiques, gadgets and electronics, upscale dining options and a “Town Square” complete with bars and outdoor event spaces. Don’t miss the Thai Puppet Show or Calypso Cabaret. Location: Free shuttle from Saphan Taksin. Know before you go: The shuttle ferry ends at 23:00. Taxis are not recommended, traffic is very heavy. To get a true glimpse into daily Thai life unadulterated by the modernity of the city, take to its extensive network of canals, or klongs. Extending from Bangkok’s main waterways, canals are accessed by the Chao Phraya itself, from the Klong Saen Saeb (east-west across Bangkok), and within Thonburi. Many tours are available and typically recommended when exploring the klongs. Long tails are also available for hire, but like with tuk-tuks, make sure to negotiate your prices before embarking. Or simply book online at ActivityFan as this is already the best price on the market. The large public boats do not access the klongs. Bangkok is truly the food capital of Asia. Chefs from around the globe flock to showcase their five-star menus fitting every cuisine and palate imaginable. Not all of the top dining experiences are terrestrial, however. Dine like the royalty of Bangkok-past aboard a charming Chao Phraya dinner cruise. 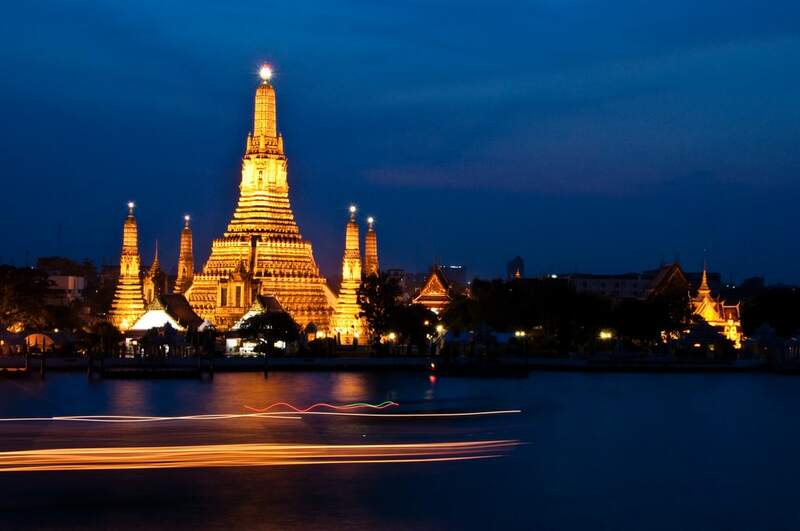 The city’s top attractions along the river including Wat Arun and The Grand Palace, are unquestionably seen best by night. The temples shimmer, juxtaposed against the towering skyscrapers of modern Bangkok, creating an unforgettable dining experience. Meanwhile, onboard entertainment serenades as you take in the sights. Take a step back in time by boarded Manohra Cruise’s restored wooden rice barges. This two-hour cruise boasts menu highlights like classic Tom Yam Goong (fresh river prawn with straw mushrooms) or Massaman Nua (slow cooked beef in a Massaman curry with sweet potatoes and shallots.) If you’d prefer riverside to waterborne dining, the outfitter also hosts a mythical performance at its Riverside Terrace. Accompanied by seafood barbeque and authentic regional cuisine, the show chronicles Hanuman’s journey from heaven to earth in pursuit of good versus evil. The Chao Phraya’s first operating dinner cruise, Loy Nava, has been captivating visitors for more than 40 years. Proudly boasting its traditional roots, the company offers both a sunset cruise and a romantic candlelit dinner cruise. Different packages are available inclusive of a certain number of drinks per person. Private charters are also available. With its slightly smaller price tag, the Chaophraya Cruise is an incredible way to experience the glow of the nightscape city in a casual-dining atmosphere. The cost of a ticket includes a welcome drink, live music and a buffet dinner with Thai and Western options available. Thailand’s former capital, Ayutthaya is nearly unrecognisable when compared to its frenzied neighbour, Bangkok. Sitting at the joining of three rivers, this ancient island city was once the largest in the world, boasting 1 million inhabitants in 1700. An international trade hotspot and hub of culture and diversity, Ayutthaya met its demise to the Burmese in 1767, burnt almost completely to the ground. Today some remains do exist in spite of the destruction, including temples and palaces. Its close proximity to Bangkok makes it an excellent day or overnight trip from the city and is refreshingly less touristic. While accessible by car, train, or even bicycle, the journey up the Chao Phraya River is like a trip back in time to a period when the river was the most important mode of transport in the region. Boat cruises must be pre-booked and there is no public boat – only tourist trips. Meandering through small fishing villages and floating markets, a boat cruise can stop off at Ko Kret and Bang Pa-In en route. Ko Kret is a small artificial island home to the indigenous Mon tribes, a people locally famous for their distinct branch of Buddhism and impeccable pottery. The island has a number of community monasteries including Wat Poramai Yikawat, a temple constructed in the traditional Mon fashion. There are also several museums notable for large collections of historical ceramics. Make sure to sample the local favourite, tort man no galah, deep-fried ground fish patties with herbs and tempura vegetables in sweet and sour sauce. No trip to the ancient capital is complete without a stop at Bang Pa-In Royal Palace. The customary summer home for the Siamese royalty, the complex is pristinely manicured and features Chinese, Thai and colonial-style architectural influences. Rent a golf cart to take in the grounds, then take a cable car across the river to the Buddhist temple of Wat Niwet Thamprawat. Once reaching Ayutthaya, there are a number of ways to experience the ancient ruins. Bicycles available for rent will get you along the 20 or so kilometres of paved paths and even the nearby sites like the local floating market. Motorbikes and tuk-tuks are also available throughout the site. The island itself is home to a number of sacred places. While many of the temples do charge entry fees, you can buy an access pass to visit all of them for just over 200 THB. You can also visit defensive fortresses, memorials and National Museums. The areas surrounding Ayutthaya proper are incredibly interesting to explore as well. The city was a major trading post in ancient times, but foreign nations were not allowed inside of the city walls. This prompted the establishment of busy and thriving settlements by the Dutch, Japanese and Portuguese. Why Go for a Chao Phraya River Cruise? The Chao Phraya River provides romantic access to the Bangkok of the past. As a city whose identity is hardly affected by the mass tourism, journeying along its main artery you’ll see the daily life of Bangkok buzzing beneath the surface. Escape the smog and tuk-tuk exhaust, and whether venturing among the locals to riverside villages or undertaking the ancient voyage to Ayutthaya, tick off all your of your Bangkok bucket list in style.